Video game clothing emporium Meat Bun returns just in time for my Australian winter with a range of shirts based on that most timeless and unchanging of genres: racing games. 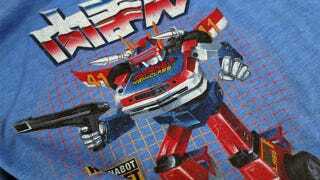 The four news shirts draw on everything from Ed "Big Daddy" Roth to Mario Kart to OutRun to a Daytona x Transformers crossover. My body isn't the only thing ready. My wallet is as well. Note that one of Meat Bun's bossmen is four-time runner-up in the Kotaku facial hair jamboree Michael "Michael" McWhertor. So if you think the chin in some of these photos looks familiar, well, that's because it probably is.